Make your own music background. 1. Open GarageBand ---> New Project ---> Loops. Name it [yourname2011].band. 2. 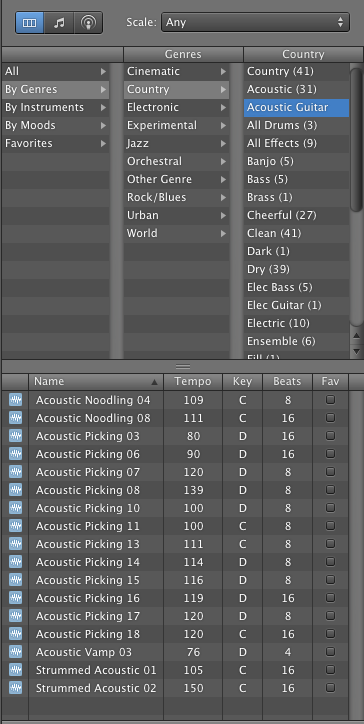 Choose "New Track" Real Instruments. 3. Choose the icon of an eye in the lower right -- see blue below. 6. Listen to the loops to find those you like (you might want scratch paper to jot down the titles). I used Acoustic Picking 13 four times (13.1, 13.2, etc.) and Strummed Acoustic (01.1, 01.2 etc.) and one more, repeating with the Acoustic Picking 13 four more times at the end. 8. Listen to your loop! Listen to my loop by downloading the file attached below. 9. Go to Share --- Send Song to iTunes. 11. 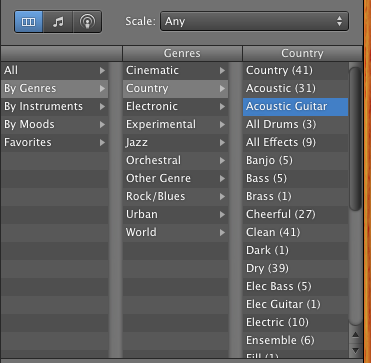 Open iMovie, go to the music icon --- Garageband -- and drag your loop into the grey area of your project.